﻿ "Pataakha"... Two warring sisters, a nutty premise and plenty of fireworks! Tusshar Sasi	 September 30, 2018	 Leave a Comment on “Pataakha”… Two warring sisters, a nutty premise and plenty of fireworks! Remember those eccentric comedies about identical or separated conjoined twins with lives and emotions inexplicably connected? Vishal Bhardwaj’s Pataakha stems from a similar foundation but wait, there is no love or affection in the picture here. Badki/Champa (Radhika Madan) and Champa/Chutki (Sanya Malhotra) are biological sisters and the only sentiment connecting them is that of unbounded hate. Children to a single dad (Vijay Raaz), the girls make each other’s lives miserable besides their famous street fights which often sees Dipper (Sunil Grover) playing the wingman. As we know, Vishal Bhardwaj is quite an pro when it comes to writing dark humour. Adapted from Charan Singh Pathik’s original story, here’s a film that is similar in texture to Bhardwaj’s own Matru Ki Bijli Ka Mandola, however, sans an assortment of characters, politics and subplots. The agenda for Pataakha’s protagonists is to get away from each other and to embrace their respective dreams. Named cheekily after frangipani and marigold flowers, Champa and Genda are as different and incompatible as the flowers themselves. Champa aspires to open her own dairy farm and Genda wants to master the Englishman’s language and launch an institute in the village. As fate has it (as seen in the trailer of the film), the duo ends up in the same household after getting married to siblings (Namit Das, Abhishek Duhan), shattering all their dreams to be apart, let alone finding avenues to chase what they want in life. Genda and Champa, we observe, are designed by Bhardwaj with all the right layers and nuances including a running analogy to Indo-Pak ties. Come to think of it, the duo is seen engaged in a massive fight in one scene and moments later, we see them share a beedi. They escape their father’s thrashing and run all over the village, only to hide in a corner by the banyan tree – clinging to each other like kittens. Mind you, there is no love involved here and this is more of an arrangement that they find to safeguard themselves. Things get all the more complicated post-marriage when Genda and Champa see no decline in their hate feelings. At one point, with the help of Dipper, they decide to unite for their make-or-break cause. What follows is an exhilarating trip that will have you on chuckles throughout, with the filmmaker re-asserting his characteristic style once again. Talking about Bhardwaj’s dexterity over his pen, Paatakha leaves us wondering how he brings alive a flavour of eccentricity in the trickiest of atmospheres. The film’s universe is fully rooted in a realistic/distinct ethnic identity but seldom do we question the need for its characters to behave like adults. Champa and Genda flight like children, showing no signs of calming down. Their aggression is forever left at a compromised stage with them continuing to look for options to get rid of each other. We also see the father trying to reconcile them but with complete knowledge that the women will have their ways at the end of the day. Ditto for the rather shakily written Dipper who is the perfect referee for their fights but is also an equal well-wisher to both. There are moments when we question his immediate intents but the film locks him safely in its absurdist template. Coming to the film’s absurdity quotient, Pataakha lacks in typical abstract elements. The characters neither belong to a la la land nor do they breed aspirations for an existence that borders on nihilism or similar philosophies. Following the story’s slightly absurdist tenor, Pataakha eventually exposes the seething jealousy they have for each other, which even goes down to affecting their health adversely. Writing apart, brownie points to Bhardwaj’s unapologetic methods in creating great tension while also remaining in the film’s fascinating dark humour zone. Mind you, the central crux not very sensible from a worldly point of view. Yet, Bhardwaj’s ability to hold on to his conviction works exceedingly well. Among the problematic areas, the narrative tries hard in balancing pace. Pataakha runs subliminally in segments where each episode comes with a solution/turning point. Given the way they have been written, shot and edited, one feels how the humour gets a little repetitive in parts. Plus, the fights see a similar pattern, each of which ending with the father finding a temporary solution. Pataakha, again, stagnates after the interval point where Genda and Champa wait for their fate to change, adding dullness to the otherwise volatile, lively film. Talking about the marriage, I also felt that the love stories lacked a strong footing. 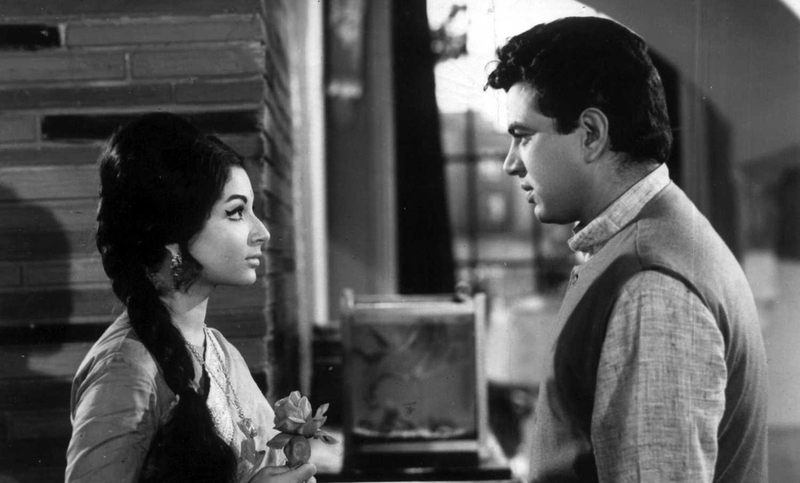 Bhardwaj gives us two meet-cutes but neither of them forms convincing plot points to gravitate suddenly into romantic relationships. The husbands, though extremely well-performed, get characters that lack in depth. Besides their adorable ways (Duhan, in particular), we do not witness much of a personality in them. Even when they lock horns with each other, their belligerence appears forced and one-sided – as if the film wants them to behave in a particular way and not the characters themselves. The grandmother, in contrast, is a lot better despite having fewer hues and lesser screen space. Dipper, as mentioned earlier, is again a confusing yet integral cog in the wheel. The film needs him to complete or even out the sisters’ rivalry but it also doesn’t know what his exact mindscape is like. Bhardwaj’s original score and songs, too, leave us underwhelmed. Quality of the score aside, there are times when they are severely muted and others where they are operatic and traditionally Bollywood-like. This is quite a downer because Bhardwaj is forever known to use his music to great effect even when his films fail to match standards. Having said that, one must give it to him for finding the perfect actors to give life to Genda and Champa. Not only do Radhika Madan and Sanya Malhotra look like siblings, their contrasting character traits (other than being ferocious, which both of them are) only add to making them the right forces to anchor the story that Pataakha wants to say. Vijaz Raaz is charismatic as the father even though he gets only one thing to do throughout the film – to feel helpless and agonized over his daughters’ unending fights. Sunil Grover is excellent as the wicked Dipper. Only he could have pulled off some of the film’s generic comedy scenes such as the one with two women shoppers at the village mela. Pataakha, for some mysterious reason, reminded me of the recently-released Love Sonia which was a hard-hitting story of two sisters living in poverty, complete with a father dabbling with debts. If love was the binding force in it, Pataakha sees hate in its brutal form. If all the sisters wanted was to get together in the former, the latter is all about their desire to disappear from each other’s sight. One rides on optimism and the other is high on situational humour proving how there exist people of all kinds within same or similar. The same goes for cinema as both filmmakers manifest their respective stories with notable flair despite having the same backdrops inhabited with familiar faces. Talking strictly about Paatakha, I would want to see Bhardwaj make more of such oddball comedies as opposed to those heavily mounted magnum opuses that he seems to be fascinated with. The film is witty, original and flavourful and also contains every conventional element of entertainment. Give it a shot! Next Post“Andhadhun”… Of mystery, music and masterful filmmaking!